In a career which has spanned 16 years and 62 fights, there isn’t much around the mixed martial arts block Yves Edwards hasn’t encountered. The 36-year-old “Thugjitsu Master” has competed on every major stage the sports has presented for the better part of the past two decades and maintained a high level of performance as he’s consistently competed with the best lightweight fighters the world has to offer. Throughout Edwards’ career as a professional mixed martial artist, he has witnessed firsthand the sport growing from a battlefield dominated by single discipline specialists to a realm where only those with the most versatile of skill sets remain at relevant status. Where fighters once got by using a strong foundation in wrestling, jiu-jitsu, or striking, Edwards has always been an example of a fighter who presents the complete package inside the Octagon. But you wouldn’t know that from talking to him. Despite a trove of documented video evidence and an impressive highlight reel to prove otherwise, the American Top Team product is slow to give himself credit for anything more than being a fighter who has consistently shown up to do his job. While the majority of his peers would be quick to admit to pioneering any aspect of the sport, Edwards’ modesty and downright humble nature refuse to allow him to categorize himself anywhere near the word exceptional. Unfortunately for Edwards in that particular regard, competing in a highly visible public forum has provided plenty of proof to the contrary. “I think it is a testament to my training,” Edwards said. “Everybody trains to fight a specific guy and the skills he brings to the table, but when I train, I prepare to as if the opponent I’m about to face is the best at every aspect and discipline. I am training for the best guy in any aspect of the game because when it comes down to it, I have to make adjustments, and it’s not a big deal to me. It is kind of like shifting gears. “You absolutely have to excel in all aspects of MMA to remain relevant these days. I feel like I was one of the guys who saw that back when the shift started happening and has been able to change up styles and make adjustments during the fight throughout my entire career. But look at the guys from the past who did last and had success working off their major strength. Guys like Chuck Liddell and Randy Couture were specialists but also had the ability to branch out. Where Edwards was on the front wave of the movement for fighters to become more versatile, his journey throughout the sport has certainly come with its fair share of ups and downs. And with the hovering “a fighter is only as good as his last fight” mentality that is prevalent on the current landscape of MMA, it becomes easy to see why Edwards may be slow to put himself at the forefront of any particular thing. All truths being told, while Edwards has enjoyed a solid track record of success while competing in major promotions throughout his career, he’s also faced a series of rough patches as well. At times he’s appeared to be an unstoppable force equipped with a nasty ground game and put away power in the striking department, and in other cases, has appeared outmatched by what the opposition has brought to the table. While successes and setbacks have come at different intervals throughout his lengthy career, the one constant which has remained is Edwards’ ability to endure and adapt the ever-changing environment of the sport. Make no mistake about it, Edwards is as game a fighter as they come and these days he’s on a mission to prove there is still a place for him competing on the sport’s biggest stage in the UFC, and he is in the process of sending that message loud and clear. “The most important thing for me right now is being able to perform,” Edwards said. “I want to show I’m still making progress, I’m not too old for the game, and I’m continuing to get better. That is what I’m trying to do every day in the gym. I’ve always had the philosophy that if you are not getting better at something you already know or aren’t learning something new, then you have wasted the entire day. I’m still going to the gym with that attitude and trying to pick up new things. Following a lengthy layoff due to injury and bout cancellation, he made a thundering statement by knocking out heavy handed powerhouse Jeremy Stephens in the first round of their bout at UFC on FOX 5 in December of 2012. Next, he was looking to build momentum off his “Knockout of the Night” earning performance when he faced promotional newcomer Isaac Vallie-Flagg, but was edged out in a hard fought split-decision at UFC 156. While the loss to the Jackson’s MMA-trained fighter certainly provided a setback on his path to once again establishing himself in the lightweight fold, a 16 year career in the turbulent world of MMA has taught the crafty veteran how to adapt to the ebb and flow of wins and losses. 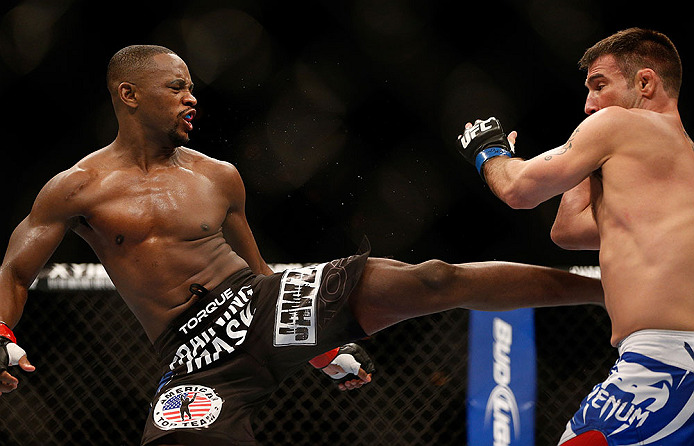 “Every fight counts and that is the biggest thing,” Edwards said. “I was disappointed in my third round performance against Vallie-Flagg. I felt I did enough to win but I understand when it goes to the judges it is out of your hands. That fight with Vallie-Flagg was a tough one, but there aren’t any easy fights in the UFC anymore. I’m always looking at the next fight like it’s going to be my toughest yet because preparing for it is always the hardest part. Edwards’ wealth of experience will come in handy when he steps in to face short notice replacement Darren Cruickshank at UFC on FOX 8 in Seattle on July 27th. Edwards was originally slated to face fellow seasoned veteran Spencer Fisher on the card, but when “The King” was forced to withdraw due to injury, the Detroit-based TUF alum stepped in to the fill the spot. Where last minute changes can be difficult to handle, the 11th hour opponent switch is just another adaptation for a fighter who has been adapting throughout his entire career. “It is just one of those things,” Edwards said. “Anything can happen in this sport and I wasn’t surprised by it. Things are a little different this time because even though he is also a striker, he is still a completely different guy. Spencer was a southpaw with more traditional boxing and Darren fights orthodox with a more traditional karate base. He likes to throw a lot of spin kicks and different types of strikes, so we had to change things up a little bit. “The news of the change came pretty close to the fight but it was still far enough that I had time to make the adjustments in camp and my training camp was good for this fight. It also has to be tough for him because he’s taking a fight on two week’s notice.